The Washington Governor’s Mansion is located west of the Legislative Building, overlooking Capitol Lake, Puget Sound and the Olympic Mountains. The Georgian-style mansion is the oldest building on the Capitol Campus in Olympia. In 1908, the mansion was built, in part, as a temporary, official state house for greeting important visitors on their way to the 1909 Alaska-Yukon-Pacific exposition in Seattle. 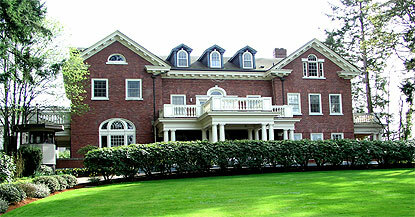 The Tacoma architectural firm Russell and Babcock designed and supervised construction of the residence at a cost of $35,000. In March 1909, when Governor Samuel Cosgrove died shortly after taking office, Lieutenant Governor Marion E. Hay and his family became the first occupants of the mansion. In 1912, when construction of the new Capitol Campus began, architects Wilder and White planned to tear down the mansion and construct an office building on the site. For various financial and political reasons, the mansion has remained, and all governors and their families have lived in the residence since 1909. The four-story building is constructed on a concrete foundation, with wood framing and a brick exterior facing. Having been constructed as a temporary facility, the structural integrity has been compromised by natural causes. In 1949, an earthquake caused water pipes to burst and the mansion chimney to fall over. Former First Lady Evelyn Langlie was nearly hit by falling debris. Extensive upgrades and renovations have been necessary throughout the years. A three-year renovation project began in 1972 to add seven rooms to the rear of the mansion. This renovation increased the mansion size to 26 rooms and more than 21,000 square feet. In 1999-2000, a $2.7 million project involved replacing wooden floors; fixing leaky roofs; installing air-conditioning, additional fire sprinklers and communications equipment; remodeling the private quarters; patching bat holes and more. The 2001 Nisqually earthquake caused minor damage to interior plaster walls and exterior brick work. All earthquake damage has been repaired. Some of the original furnishings, purchased from the former Frederick & Nelson of Seattle, are still in the mansion including the state dining room set and a grandfather clock. Many other antique pieces have been added throughout the years. A group of private citizens, the Governor’s Mansion Foundation, created by former First Lady Nancy Evans, has furnished and continues to maintain the furniture and accessories in all the public rooms on the main floor, and two guest bedrooms on the mezzanine level, at no cost to the taxpayers of Washington. The most recent assessment valued the mansion at $5 million. Public tours of the mansion are currently not offered. The tours are scheduled to resume in December 2004.